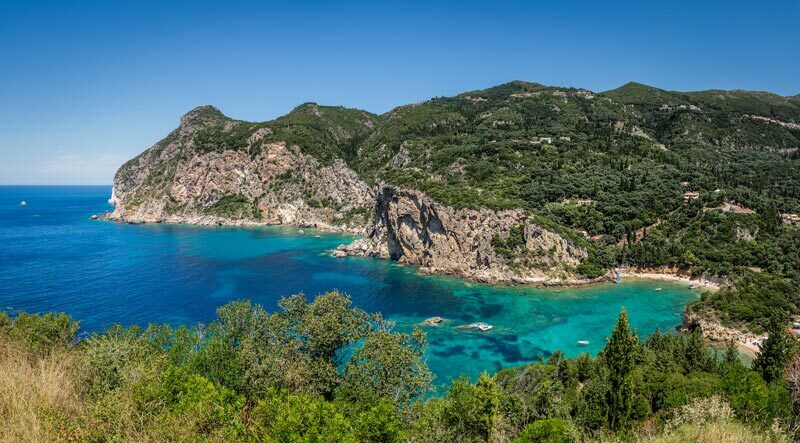 Corfu is a beautiful Greek island, a true earthly paradise with its beautiful beaches and crystal clear sea suitable for all fans of snorkeling, diving and water sports of all kinds. To fully enjoy your vacation in Greece, you can book a guided tour to discover the island’s main attractions and theme tours are ideal for discovering the peculiarities of Corfu. The opportunities for fun are not lacking! If you love long stretches of sand, shorelines equipped for tourists or wild creeks, then here is a list of goals, some of them considered among the best beaches of Greece, you will surely fit your tastes. 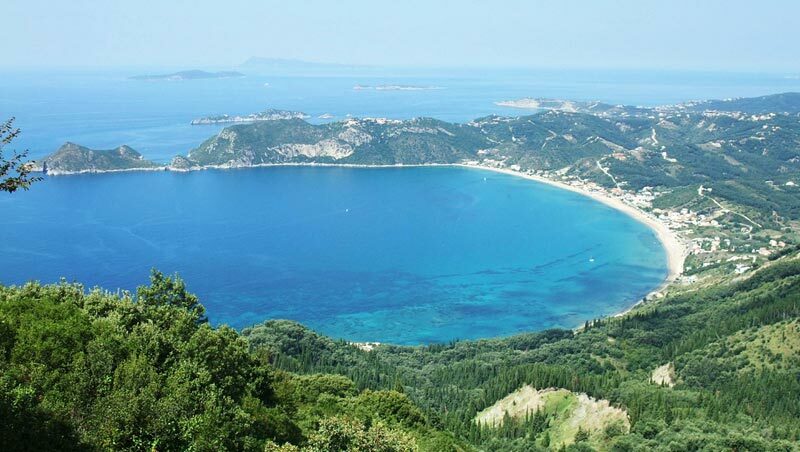 It is one of the most famous beaches in Corfu, the one where Ulysses landed, repeatedly awarded a green area for the beauty and quality of the sea. It’s great so much to offer five different bays and six bays consist of sand and gravel. It is the longest beach of the island, so even the most tourists. Obviously it is equipped with facilities of all types and is perfectly suited to families. In second place on our list, we find the beautiful village of Sidari, at 40 kilometers from the capital and the airport an hour’s drive. The village is very characteristic for its thrilling beaches: one of the places not to be missed for this location is definitely Canal D’Amor, an area with rock formations from different shades of yellow topped by vegetation. It is one of the most popular attractions of the island and, according to local tradition, the couples who swim in this channel will be married very soon. Also, it does not miss the night life and the presence of discos and pubs to suit all tastes. 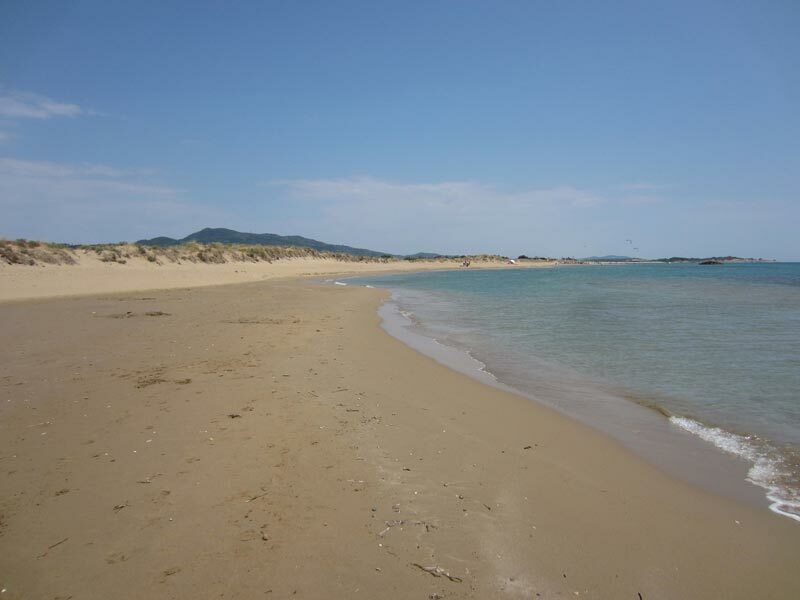 Located in the south of the island we find the beach of Agios Georgios, a perfect place for those who love the sea and want to enjoy long walks on the golden sand. A short distance from the coast, this is the lake Korission, an ideal wetland for those who want to practice birdwatching. The beach and its surroundings, however, are designed for lovers of kite surfing, of cycling and of walking around the green hills rich in olive groves. The area is not very developed in the tourist aspect, but it turns out to be an ideal destination for families with children. To get there just take the main road that leads to Kavos Corfu and Lefkimmi and cross Moraitika and Argirades. 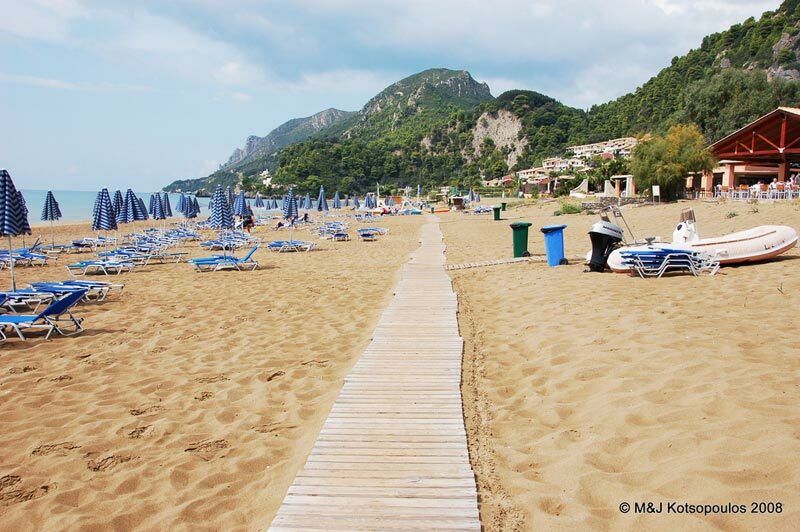 Glyfada is a popular golden beach by the Greeks, located 16 kilometers from the capital of Corfu. Shallow, clear water (often rough) and unspoiled nature await you at this magnificent beach. Young people, in particular, love this destination for its many bars and available for a small rocky area where nature has created the beautiful natural pools. To reach this place, you have to cross the heart of the island and follow the road to Paleokastritsa. Do not worry about parking: close to the beach there is one free during the low season, while during high season you will be asked a small fee. Halikounas is an unspoiled beach that separates the sea from a lake, a small hidden treasure, a surfer’s paradise, suitable for all people who like to relax. Remember to bring your drinks and food, because it is not a tourist resort, this area is not equipped. The tranquility reigns here actually sovereign. 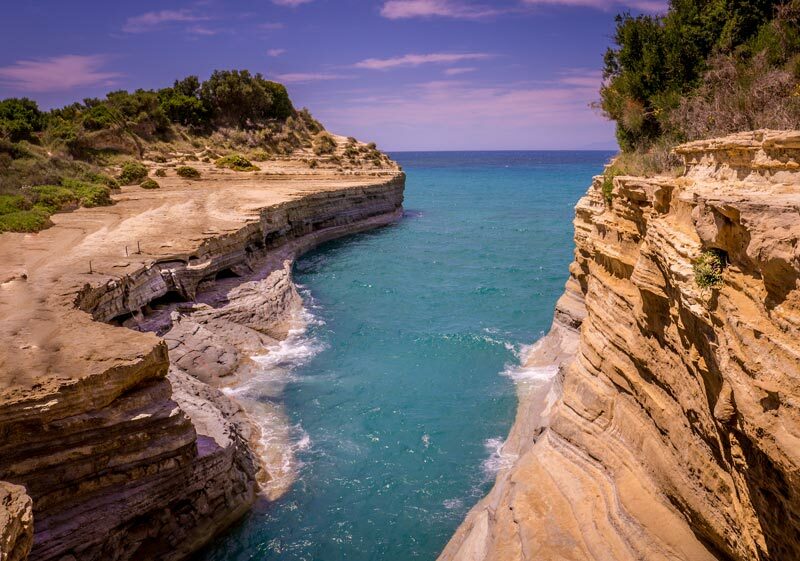 Liapades is a beautiful beach located on the west coast of Corfu. For tourists who love peace, it is the perfect place to avoid the crowds at the absolute fun search. The unspoilt nature and the emerald green of the sea are combined with sand and white pebbles and give birth to a little extended coastline, only 100 meters. 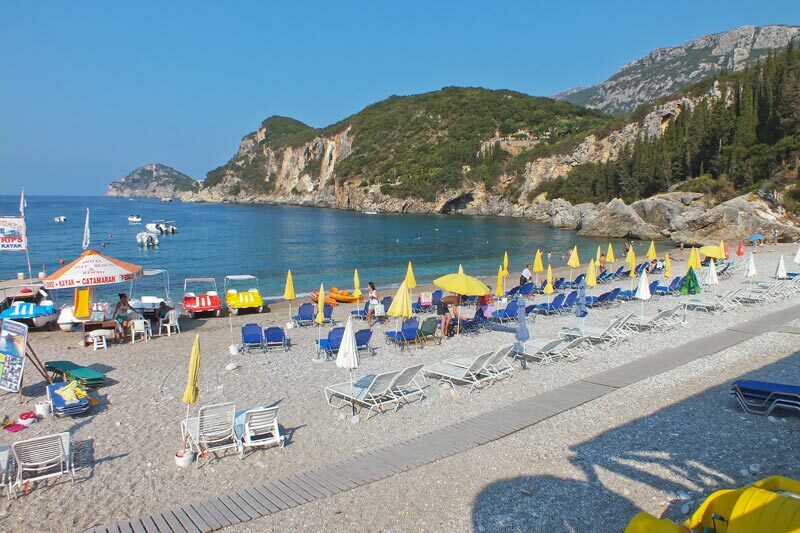 This beach offers the best services in the area: from the rental of beach umbrellas and deck chairs at the possibility of water sports; there, also, bars and taverns, as well as the taxi boat service. Thanks to the many paths you can reach 15 small secluded beaches, ideal to recharge your energy. In the northeastern part of Corfu is the Avlaki beach, halfway between Kassiopi and Agios. It is a place very quiet even during the summer chaotic periods. One of its advantages is to be caressed by a breeze that helps to withstand the summer heat. The very pretty beach of white pebbles, quiet, perfect for children and equipped with tavernas where you can have a hot meal. 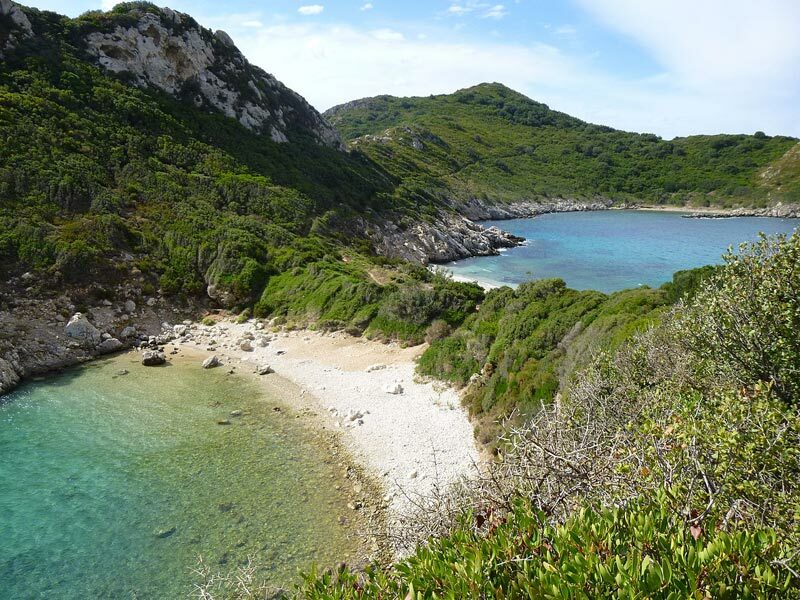 Porto Timoni is the name of the two hidden bays below the promontory of Afionas, perfect for those seeking peace and solitude during a vacation. Sea and unspoiled nature are not easy to achieve. To get close to Porto Helms is necessary, in fact, take a boat or follow the steep path, narrow and difficult that leads to these creeks and need at least 30 minutes of walking. 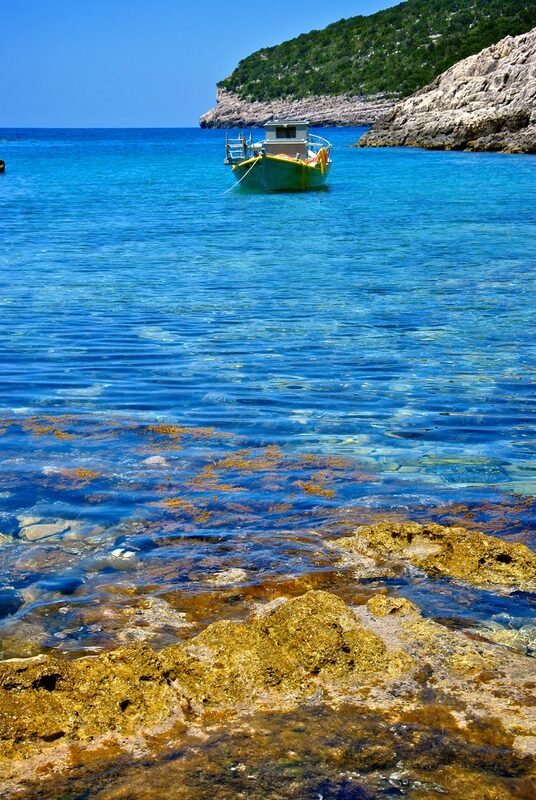 The largest bay overlooking the open and is characterized by very clean water ideal for snorkeling sea. The smallest is always sandy, but characterized by the presence of bushes and shrubs. Paramonas is an area frequented mostly by Greeks and located just 4 kilometers from Pendation. Not recognize the village is impossible, since it is characterized by colorful houses surrounded by olive trees. In the same area there are other beautiful beaches and inlets including Kavouri and Skidi, often deserted. Paramonas is, however, the cove, the most characteristic of those that follow one after the other to Lake Korission. The windy afternoons are the best time to visit this beach, that way you will suffer less than the summer heat. The Greek islands are always among the most popular destinations, and now you will have understood why tourists from all over the world love Corfu and its beaches. Our article aimed to present the most beautiful, now is up to you to choose which to visit.